originally published in Der Weltkampf, May 1925. 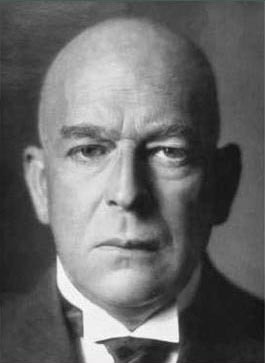 The personality of Oswald Spengler has stood for years, since the appearance of his chief work The Decline of the West [in 1918], at the center of public interest. Without question this famous work is riddled with many flaws. There is no question that next to fascinating ideas, often platitudes are found. Without a doubt there is something embarrassing about receiving many views of other people served up ostensibly as Spengler’s intellectual property. In spite of everything however, the attack on our school wisdom has had a refreshing effect and set in motion many agreeing and opposing forces, thus begetting life. And in the spiritual quagmire of the present, that is in any case to be welcomed. I do not want to discuss the Spenglerian worldview in general here. Let only one question be selected: Spengler is supposedly an irrationalist (i.e. he is averse to purely rational judgment). He seeks soul and form, but in the course of his work turns into a purely naturalistic dogmatist who arrives at his finding of the inner and outer decline of our culture on the basis of more or less bald, rational observations, and therein overlooks precisely the form and soul of the Eveningland. Spengler regards the rise and fall of cultures as an occurrence similar to the life and death of a plant, but forgets in the adducement of this richly superficial comparison that races of plants as such do not die out if they are not destroyed, crippled, mixed with inimical types. The "race" of the fir tree persists although the single fir dies. The "race" of the linden tree is still the same as many thousands of years ago. And the races of men as such could remain just as eternally young, if hostile blood is not mixed with them, if unassimilable spiritual opposites do not clash and mix with them, without being able to be blended. Thus Spengler’s treatment of history remains stuck in a somewhat exalted environmental theory; his doctrine of the cultural group [Kulturkreislehre] lacks the essential thing: the organic-racial prerequisites, and, bound with them, the embodiment of the spiritual forces that created this cultural group. It is significant above all that Spengler vigorously combats the folkish idea, dismisses anti-Semitism, and yet, despite all these protests ... succumbs, and truly in such a scope that he makes almost all folkish political positions into his own, without however admitting this, even with a single word. Spengler continues then and also attacks the nationalist side, and indeed at a vulnerable point. He says that “ethos” and experience in governing are there, but also a deficiency of intelligence, of understanding of the world [Welteinschaetzung], of breadth of vision. Both the landed nobility and the representatives of industry had begotten no talent whatsoever for the art of politics; the strength of the nationalist parties would remain a mere episode. And then Spengler embarks upon a criticism of the folkish parties. He begins with a parallel from the French Revolution, in which between 1794 and 1799 a regression into a bloody, frightening age occurred, when the awakening "Jeunesse dorée" (Gilded Youth) wanted to make policy with fists and cudgels – and wrought destruction. The same role, according to Spengler, is played by today’s folkish, who through “sincerity and small-mindedness” would bring disaster, would [inadvertently] labor for France. “Childish opinions,” says Spengler, “sever the folkish movement and therewith the mighty striking-power [gewaltige Stoßkraft] residing in it so completely from everything that is to be taken seriously politically and economically by talent, experience, power, and connections [Beziehungen]” that a dangerous countercurrent must take place. It is wrong, he says, to wish to build realpolitik upon racial feeling [Rassegefühl] and not to wish to treat existing financial powers as powers. Politics are not made from long skulls but from what is retained in them. Not through drummers and pipers can one rule nations. Parades and spectacles are not the way; rather the avoidance of them, since even Bismarck functioned only in the most solitary seclusion, says Spengler. While Spengler leans toward the Action Française and Fascism as the new style of politics, he ridicules the same will in his own folk. Spengler does not grasp what Hitler has done! This man recognized that he must position himself in the midst of the people; he must create a people’s movement, give the disillusioned a new faith, set a new goal. Supported by this people’s movement as a force, he could gain political influence that otherwise never would have been possible. How a foreign policy in the possession of this force would have been conducted, has been understandably not much discussed; that it would have had to be very cautious in accord with the situation, would not need to be stressed. It is certain however that in domestic policy other principles would have been established than rule today. Already in this question Spengler shows that characteristic shape-shifting of thought-processes that begin with one assertion and end in a completely different one. For, after rejecting the Jeunesse dorée, after agreeing with the Fascist principle, he praises the “astute youths” among us as “our future,” as “youngest Germany” etc. And now Spengler should ask himself after all in which camp these “astute youths” already stand today! On the question of race, Spengler is just as ambiguous. For, no sooner has he refused with marked derision to acknowledge racial instincts as determining factors, than he speaks of “Germanic world-feeling,” refers to a quantity of “magnificent men of race” among us, speaks of a right that is “born from blood,” and declares that the “Nordic life-feeling” of the Goths, Franks, and Saxons has created the type of the present nations. Justice was supposedly born from “Germanic fundamental feeling,” fed from a spring that does not derive purely from purposeful contemplations. Indeed, Spengler gets carried away to the point of exclaiming that the so-called “youngest Germany” has awakened as the best heir [Erbe] from the years of the rise of the Reich. In addition, he has also contradicted himself here, explicitly even, when he designates British politics as an effluence of the Norman essence, and at the same time praises the English instinct that put the Jew Disraeli-Beaconsfield in charge. That this man himself admitted that he was conducting Jewish racial politics in combination with English power, Spengler seems to be unaware. The connection of high finance with the London stock exchange has been tightly bound since this time. That Spengler is in many respects unfortunately correct with his assertion that sincerity is paired with small-mindedness in the folkish camp, comes primarily from the fact that the infinitely clever ones only stand on the sidelines for years, because, although they quite gladly distill an idea from butcheries of past centuries while sitting at a desk, in the present struggle they only wait nobly to see what ultimately will become of “childish opinions.” Once it has “become something,” then the learned scholar will prove with hairsplitting precision that it could only have turned out thus and not otherwise. Only a few of those men so rich in “talent and experience” have let their instinct speak and joined the fermenting movement, and struggled for its means of fulfillment. But soon that will change, and even Spengler will not be able to escape the organic power, and then of course he will proclaim that we have fulfilled his ideas.